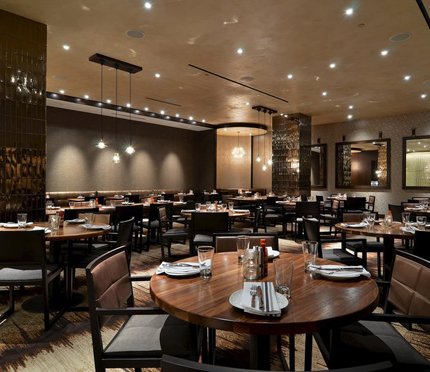 Taking their inspiration from the mason jars that are such a part of the Southern tradition, Mason Bar and Mason’s restaurant feature an eclectic mix of Appalachian and European flavors with a Southern twist for guests at the Loews Vanderbilt Hotel in Nashville, TN. Mason Bar features a custom mason jar light fixture over the bar and white leather and cowhide-backed lounge chairs throughout the space, evoking a playful and modern take on Southern traditions. A large media wall provides a great way to watch the sports or to showcase an important event. 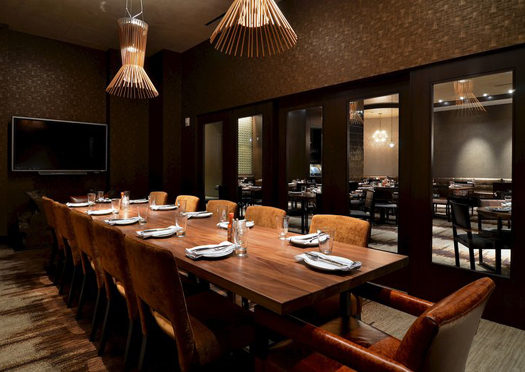 Mason’s restaurant offers a more subtly glimmering and refined atmosphere for guests. Tall walls of mason jars greet patrons, while rich chocolate tones and sparkling lights beckon from within.